Running is a complex and coordinated process that involves the entire body. Every human being runs differently, but certain general features of running motion are common. 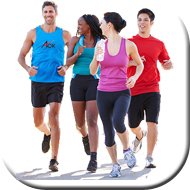 Running is both a competition and a type of training for sports which have running or endurance components. Today, competitive running events make up the core of the sport of athletics.